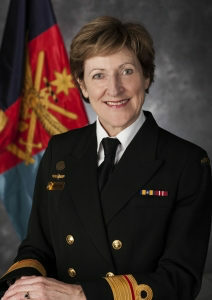 The APPRISE network of researchers wishes to acknowledge and thank Rear Admiral Jenny Firman for her wonderful contribution to national pandemic preparedness initiatives and especially for her support of APPRISE. Dr Firman has stepped down as the member of the APPRISE Expert Reference Group – where she represented the Office of Health Protection, Department of Health – to commence her new position as Chief Health Officer of the Department of Veterans’ Affairs. Dr Firman was essential in promoting the case for a new Centre of Research Excellence (CRE) for pandemic preparedness. Once that CRE was awarded to APPRISE, she continued to support our Centre in an expert advisory role, both formally and informally. While Dr Firman’s enthusiastic support was essential to the creation of APPRISE, she also enabled us to forge crucial links with policymakers and relevant government committees and other bodies. These links are indispensable to effective pandemic preparedness. We will miss her standout qualities of incisiveness, intelligence, friendship, commitment to infectious/communicable diseases and bubbly sense of humour. APPRISE researchers congratulate Dr Firman and wish her well in her new role at the Department of Veterans’ Affairs.